Literary Diversity: What Books Are You Eating? Literary Diversity: What Books Are You “Eating”? by Mia Martins, US West & Central Blogger for jaBlog! I’m going to ask you to play a game with me. Consider the books you read like food. Let’s tweak the saying: “You are what you eat,” and make it: “You are what you read.” It seems reasonable to say that books shape who you are. I’m sure most of us have felt greatly influenced by our favourite books. Consider your “book diet,” so to speak. Think about the books you are consuming. Are they a varied amount, which is essential to your overall health? Or are they the same thing again and again? You know you have to eat a variety of food to stay healthy; there should also be a variety of books in your literary diet. So how much diversity is in what you read? In this case, diversity refers to characters of colour, LGBTQ characters, and characters with disabilities. Recently, BookCon, a large readers’ convention in New York organized by Book Expo America, announced its line-up for the children’s all-star authors panel. In an industry where women outnumber men, somehow every one of the writers on the panel is a white male. This slighting caused an subsequent uproar within the YA literary community. Some presses and people refused to cover or attend the event. In response, the hashtag #WeNeedDiverseBooks went viral within days, with readers, writers, parents, teachers, and librarians advocating the need for diverse books. The authors in the panel are all very accomplished children’s and YA authors, and the backlash against the panel is not an attempt to undermine their success or talent. Instead, it is an effort to highlight the blatant lack of representation. And finally, after thousands of people pointing out the problem, a panel specifically dedicated to diversity was added to BookCon. Only 10% had a main character of colour. Only 7% of authors were people of colour. Only 6% had a LGBTQ+ main character, as well as 6% for a main character with a disability. 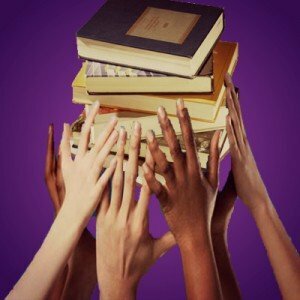 Why is there a need for literary diversity? If you find yourself asking this question, chances are you have never been oppressed, marginalized, or under/misrepresented. Many people read books as a way to escape the real world and slip into a more favourable one. And yet for many readers, books can be just as lonely as the real world. The people on the cover don’t look like them, and the characters don’t feel like them. They never see characters like themselves in the books they read. But books should be an experience that every reader can enjoy, regardless of who or what they are. But what can I do about the problem? I’m only a young reader. Express your unhappiness. Take to social media to voice your concerns and join movements such as #WeNeedDiverseBooks. Write diverse characters into your own books. I’m sure many you will become writers of all sorts–go ahead and make the change yourselves! Remember that publishing is a business like any other, run on money generated by book sales. And you are the consumer. If you consciously buy diverse books and boost their sales, this will be reflected to the publishing companies. So, if your book diet consists of all the same type of food, please take a moment to add some literary diversity to your plate. This is true and really well-written! At the same time, I find it a bit strange that people were so upset with the original panel. The way I see it, the author shouldn’t matter – only the book they’ve written. So a straight white male could, in effect, write a story about a black female LGBT character. But I suppose that depends on what they’ve written, which isn’t explained here. Still, I think it’s great that BookCon changed their ways and included a diversity panel – even if that does sound suspiciously like tokenism. But I think I’ll take it as a sign that BookCon are recognising the growing diversity in YA literature.